How does the SSC provide extra support? The Special Support Centre (SSC) aims to ensure that all children are fully included in all aspects of school life. 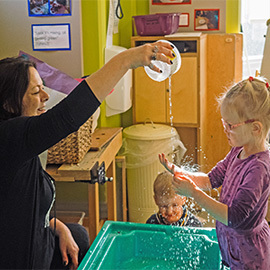 We want to enable all children to participate in the rich and exciting experiences that the Nursery School offers. The SSC offers sixteen part-time places for children with significant speech and language needs and/or a range of other special educational needs. The children attend Nursery School in the mornings or the afternoons and the SSC staff provide focused support to help children to develop to the best of their ability. The children are welcomed into our beautiful Garden Room and registered by the SSC team. When they are ready, children move out into the wider Nursery School environment where they can access the same learning opportunities as the other children.